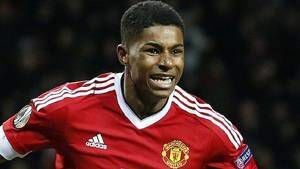 Substitute Marcus Rashford scored in stoppage time on Saturday for Manchester United to come from behind to beat Bournemouth 2-1 away. The win helped Manchester United close the gap on the top four in an exciting English Premier League clash. Poor Manchester United defending had seen Bournemouth miss three gilt-edged scoring chances before Wilson delighted the home fans with a simple tap-in. This had followed an inch-perfect low cross from the right by Junior Stanislas, after some excellent build-up play. Martial levelled when he drilled in a powerful left-foot shot from 11 metres, after good work by Ashley Young and Alexis Sanchez. The goal meant the Frenchman has scored in four successive top-flight games for the first time in his career. With Manchester United’s Belgium striker Romelu Lukaku left out of the match day squad,other forwards needed to justify their paycheck. Martial stepped up to torment his markers in the second half as Manchester United piled on the pressure.